An extremely useful color for many science fiction models and of course, civilian vehicles. Realistically replicates a stunning metallic red shade. Acrylic Metal Colors are formulated for maximum performance with both brush and airbrush. All the colors in the range can be mixed together. 17ml jar. Water soluble, odorless, and non-toxic. Each jar includes a stainless steel agitator to facilitate mixing, shake well before each use. 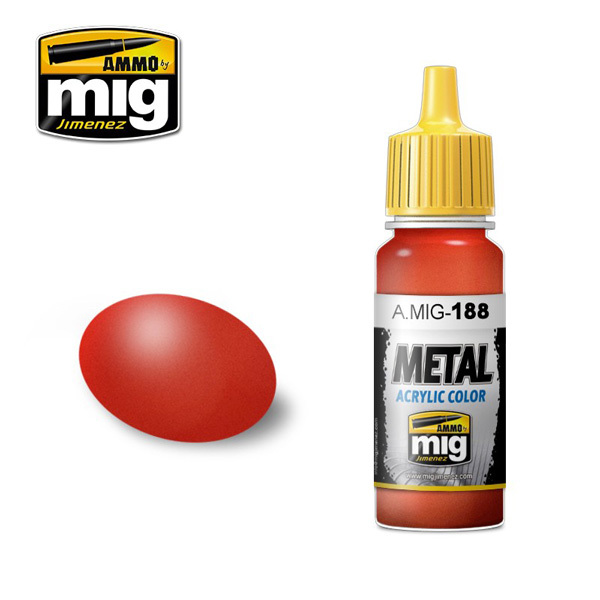 We recommend A.MIG-2000 Acrylic Thinner for proper thinning. Dries completely within 24 hours.